Some desire an impressive demise, that they may be remembered by posterity. Sometimes, though, a conspicuous passing not only comes at a heavy price, but leaves a melancholy shadow for future generations. 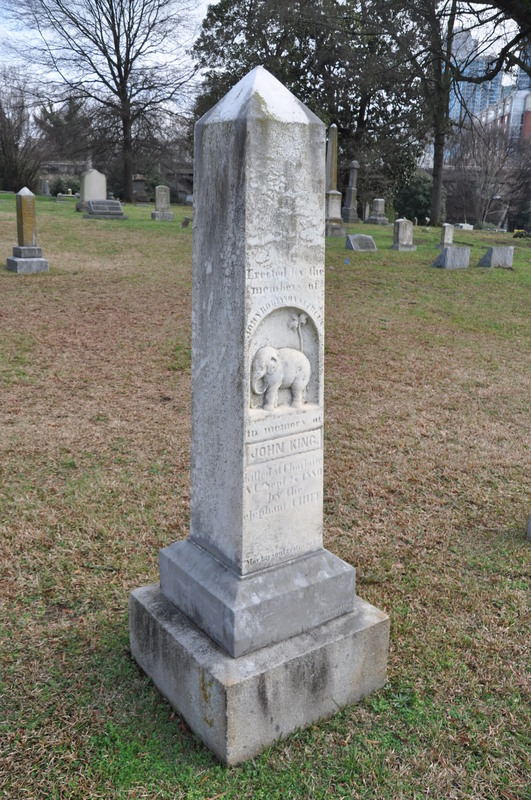 King was an elephant trainer and Chief one of seven elephants that were part of the John Robinson Circus, a family-owned circus that toured the country from 1842 until 1911. 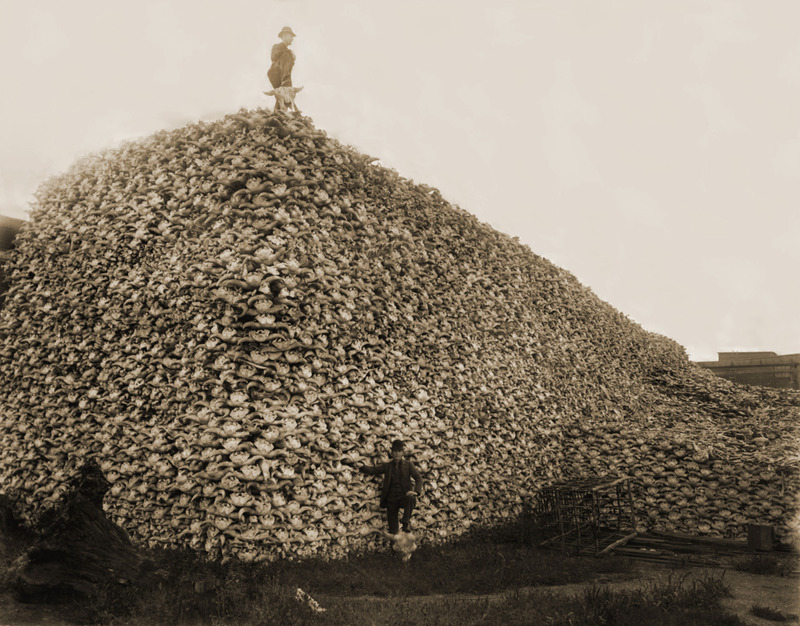 Chief, described as a large bull elephant, was apparently a handful and not fond of King. However, all the other elephants in the circus were said to love their trainer, who was quite accomplished at his trade, according to a story the New Orleans Picayune ran more than a quarter century after the event, based on a 1907 interview with an individual who was on hand when King was killed. One elephant in particular, named Mary, was said to be “crazy” about King, and would “trumpet with delight whenever she saw him approaching,” Ed Cullen told the New Orleans paper. Mary was far bigger than Chief, and her weight and power gave her the right to shine in the role of the wife who wears the trousers, but for all Mary’s Amazonian tendencies she was not a flirt, and gave Chief no cause for jealousy. But Chief early took a dislike to King, the trainer, for no other reason, I believe, than that Mary showed great affection for the man, and there were times that if King ever came near Chief the elephant would give unmistakable signs of anger and a dangerous gleam would show in his mean little eyes. 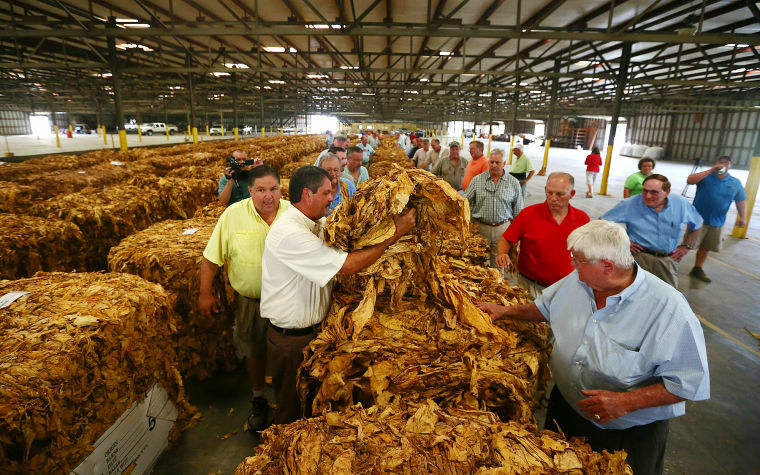 Once Chief lashed out at King with his trunk when the trainer was sweeping Mary’s sides with a broom, and the swing of the blow just missed the man. King jumped to one side, and as he did so Mary, with a bellow of rage, smashed the smaller elephant a blow on the head with her trunk that brought Chief to his knees. Mary was ready for a charge, her big head lowered to serve as a battering—ram, and Chief would have fared badly that had not King acted promptly. He knew that he could trust Mary. And, springing in front of the big beast, extended both his arms, and cried: ‘Get back, girl: there now!’ His order was obeyed, and Mary, wheeling around, went off quietly to her place, and so a panic in the elephant house was averted. The John Robinson Circus traveled not by train but by using its elephants and horses to move its animals and wagons from town to town, Cullen recalled. Mary was particularly adept at keeping the other elephants in line, moving wagons out of ruts on hard country roads, carrying tent poles in their trunks or handling other manual labor as needed. Nary a creature was stirring throughout most of South Carolina on Christmas Day – at least outside – despite 80-degree temperatures that made one wonder if it was late December or early April. 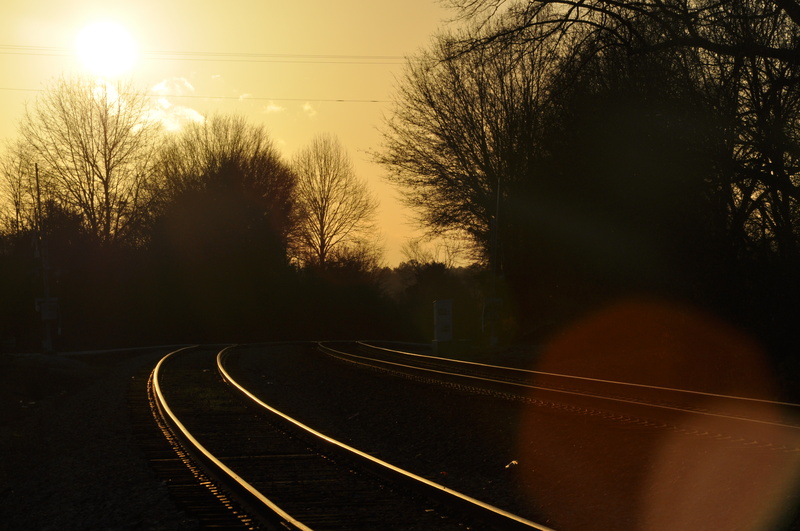 This view down the Norfolk Southern Railway lines in southern Union County demonstrates the unseasonably warm conditions that prevailed throughout much of the region. Were it not Christmas, t’would have been a good day to hop the rails and head off into the sunset. Here’s hoping all y’all enjoyed the holiday as much as yours truly did. Daughter No. 3 – the one who is so adept at (unintentionally) leaving her sisters and I in stitches by recounting such Old Testament narratives as Jonah’s Ark, how Adam and Eve were cast out of Eden for “eating the Poisonous Peach” and Moses’ adventures leading the Hebrews out of Egypt and through the Wilderness while garbed in a “flowing red bathrobe” – has shown an interest in participating in church services. This not only surprised me but made me swell a bit with pride. Maybe I’m doing something right. So after a recent mass she approached the parish priest and inquired about if she could assist with mass. I couldn’t help but immediately burst into laughter. 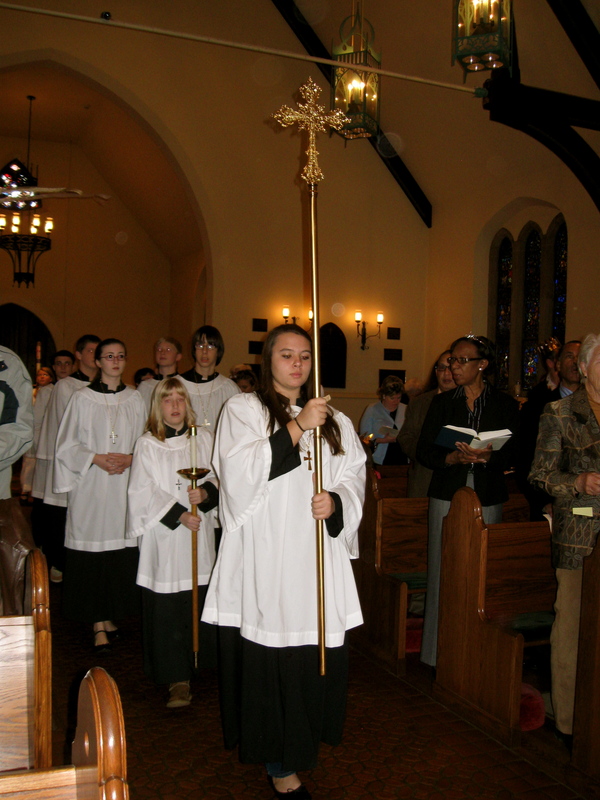 Crucifer leading procession into church. 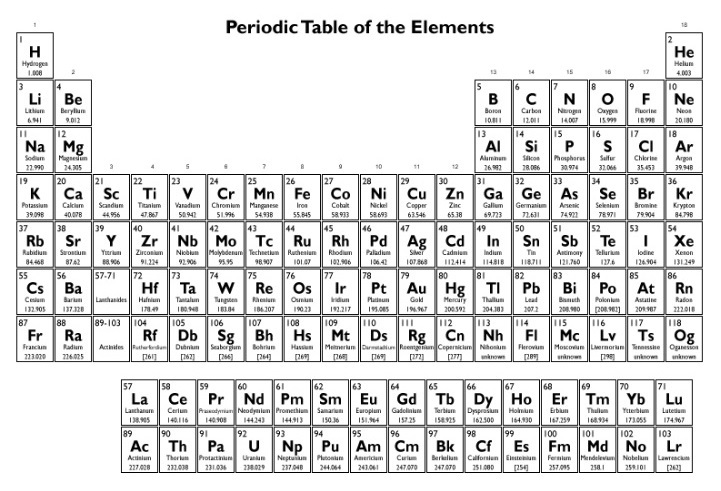 ‘Crucifier’ not pictured. The word she was searching for was “crucifer” so she really wasn’t too far off. A crucifer carries the processional cross into church at the beginning of mass and out at the end. Of course, I said I was proud of her for showing an interest in participating, but only Daughter No. 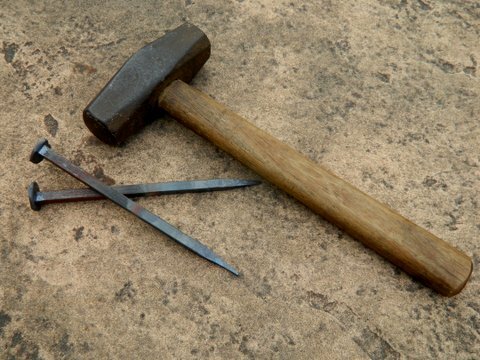 3 would come up with “crucifier” as a potential church duty. Never a dull moment with my brood. More than 3 million horses and mules were pressed into service during the American Civil War, with an estimated 50 percent – 1.5 million – being killed, wounded or dying of disease during the conflict. The last surviving horse to have served in the war appears to have been an equine named “Old Ned,” a horse owned by Benjamin Franklin Crawford, a quartermaster sergeant in Company C of the 16th Pennsylvania Cavalry. The Pennsylvania State University Libraries in University Park, Pa., contains in its records an account of the capture of Old Ned from Confederate troops and the horse’s subsequent participation in Civil War ceremonies throughout the remaining decades of the 19th century. Old Ned, which died in 1898 at the purported age of 43, was captured by Crawford after he had lost his mount during a battle in Virginia. After the war Crawford and Old Ned returned to the latter’s home in Pennsylvania driving a sulky. Crawford later served as a conductor on several western railroads. Old Jim was said to have been the property of one Lieutenant McMahon from Sevierville, Tenn., a member of Lt. Gen. Joseph Wheeler’s Confederate cavalry. As Wheeler’s men moved into central South Carolina in early 1865, trying to hold back the forces of William T. Sherman, McMahon was mortally wounded during the Feb. 12, 1865, battle and Old Jim was shot in the neck. The horse is said to have wandered onto the plantation of John Williams, who lived in the Aiken area, according to information on file at the South Carolina Historical Society in Charleston, which also contains a photograph of Old Jim taken in 1880, along with a braided piece of his tail. 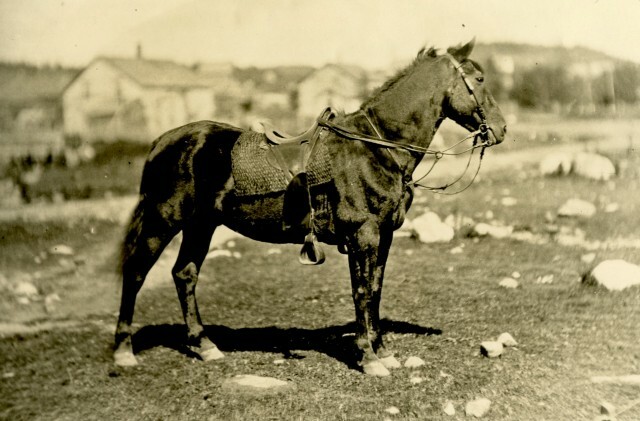 By 1894, Old Jim had gained a measure of fame as the last surviving Confederate war horse. Polyglots are a fascinating breed. As one who has worked all his life, and is still working, to gain mastery of a single language, I have mucho admiration for those who easily and fluently pick up additional tongues. 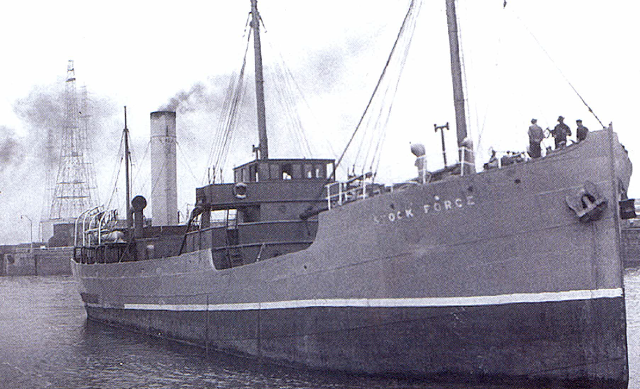 My maternal grandfather, a native of Italy who immigrated to the U.S. more than a century ago, could speak multiple languages, including Italian, French and English, along with a variety of others, due to the fact he grew up in the far northeastern part of the country, near a variety of shifting borders. I am living proof that being a polyglot is not an inherited trait. I failed English in 6th and 7th grade, and came close again in 10th grade. In addition, I barely made it through two years of college French (mandatory for graduation). Of course, upon reflection I have recognized that study habits – or lack thereof – were largely responsible for my early inability to learn the intricacies of English, as well as the basics of French. At least, I’d like to think so. Yet, there is no question that for a special few individuals, the ability to learn languages is indeed a gift. Take Gerard of Cremona, an Italian who found himself drawn to the intellectual riches of the Spanish city of Toledo in the 12th century. Toledo during this period was a true multi-religious melting pot, with Christians, Jews and Muslims living, working and learning side by side. Gerard, who was born around 1114, is believed to have traveled to Spain in his late 20s due to the lack of written scholarship available in his native area. 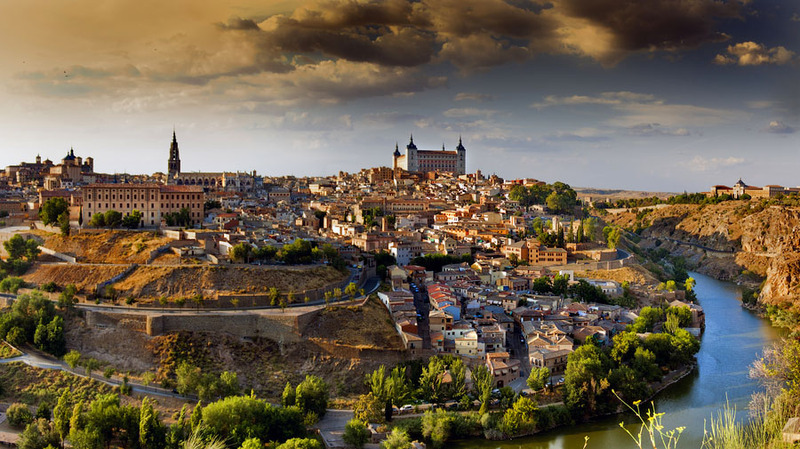 Toledo, the former provincial capital of the Caliphate of Cordoba, had been conquered by Alfonso VI of Castile in 1085 but had remained a seat of learning, with protected Jewish and Muslim areas. The city was full of libraries and possessed an abundance of manuscripts. It represented one of the few places in medieval Europe where a Christian such as Gerard could be exposed to Arabic language and culture, along with extensive written scholarship dating back to the Greeks. What Gerard saw upon his arrival in Toledo staggered him; myriad books in Arabic on every subject, all nearly unknown in Latin. Like any true polyglot, Gerard first taught himself Arabic, then proceeded to work his way through Toledo’s libraries, “churning out translations of at least seventy major works previously unavailable in the Latin-speaking west,” according to Chris Lowney in A Vanished World: Medieval Spain’s Golden Age of Enlightenment. An indication of the extent of drought conditions in southern Mexico was shown earlier this fall when a colonial-era church, under a man-made reservoir for nearly 50 years, was revealed by receding waters. 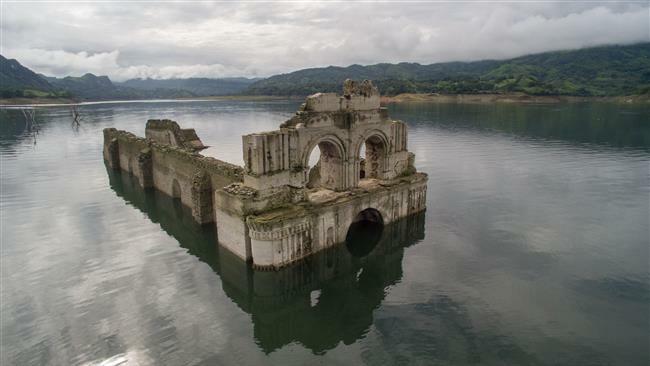 The Temple of Santiago, also known as the Temple of Quechula, is an abandoned Roman Catholic church located in the Nezahualcóyotl Reservoir in the southern-most state of Chiapas. It was built in 1564 but later abandoned due to a smallpox epidemic in 1773 and ultimately submerged by a dam in 1966. 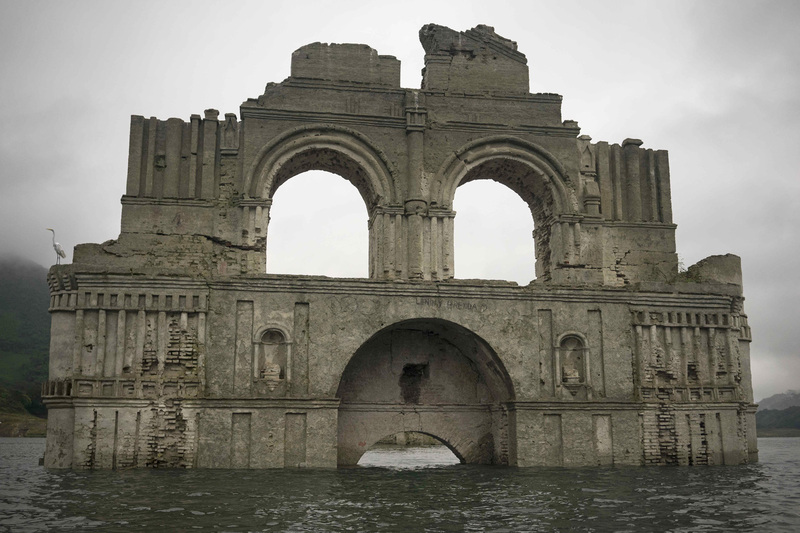 Drought conditions in Chiapas have seen the ruins rise again. In late October, the water level in the reservoir had dropped by more than 80 feet. The church normally rests under 100 feet of water. The church is 183 feet long and 42 feet wide, with a bell tower that rises 48 feet high. When constructed, it was far larger than needed given the size of the congregation, but the Spanish anticipated a population boom. While parts of the church occasionally reappear during some dry seasons when water levels are low, the only other time a sizeable part of the church reappeared previously was in 2002. Then, visitors were even able to walk inside it. The Nezahualcóyotl Reservoir was built on the Grijalva River to generate hydroelectric energy. Nezahualcóyotl is the nation’s second-largest reservoir. 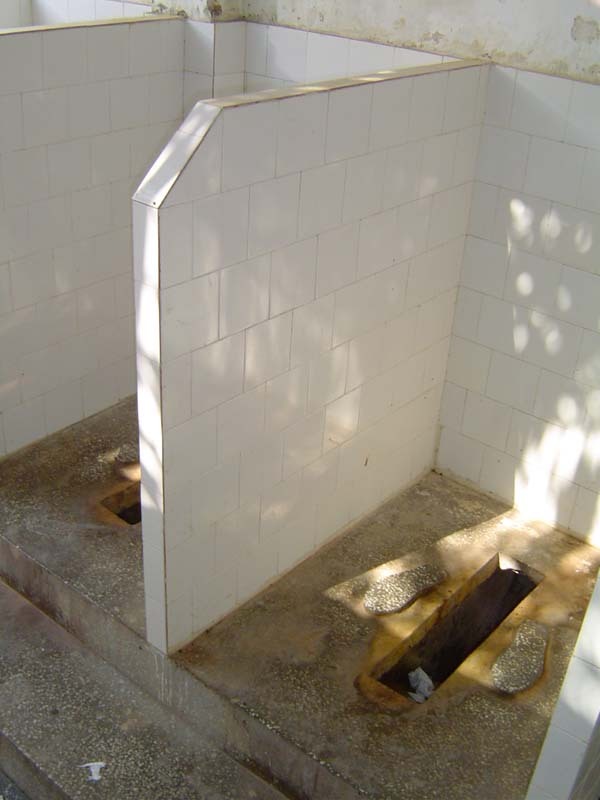 The French, for all they have contributed to Western civilization, remain an enigma for a variety of reasons, not limited to their public toilets, their habit of greeting each other with kisses on both cheeks and their penchant for driving like maniacs. Among things that have set the French apart from the rest of Western Europe is their approach to building cars. As my dad has said more than once, the French design cars as though they’d never seen one before. He was speaking specifically of Citroën, which has been manufacturing vehicles for nearly a century. In the intervening years it appears the company began to pay attention to other more stylish automakers and actually managed to churn out a variety of decent-looking cars. 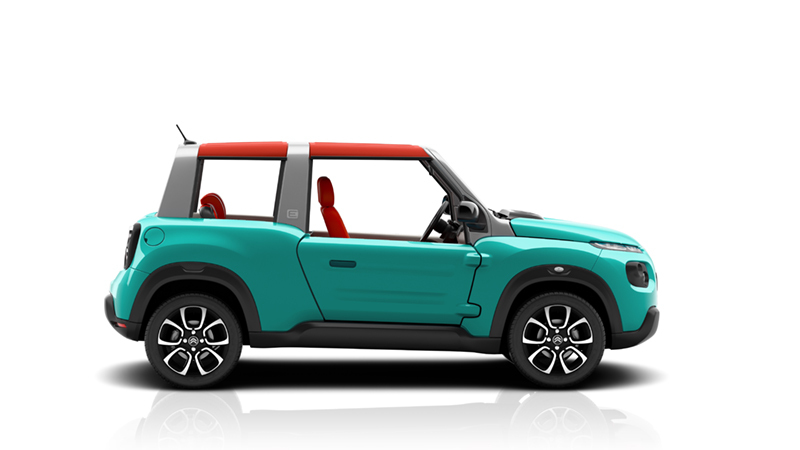 However, in a nod to its perplexing past, Citroën will soon release the E-Mehari, an open-top electric runabout that reinforces the company’s willingness to throw caution, and taste, to the winds. While the BBC’s car reviewer gushes over the new model, the E-Mehari is balky, ugly and looks to be something more akin to what a group of children, given access to plastic molding equipment, would fashion given the opportunity. It has a top speed of 68 miles per hour and a cruising range of 125 miles. It’s obvious that the PR folks at Citroën had their work cut out for them in trying to make chicken salad out this mess of chicken feathers.